I wanted to share this story I wrote about some amazing teenagers. One of the teenagers is a young adult finishing her doctrine. For about 20 years, I have been in law enforcement and unfortunately saw the negative outcome due to wrong choices. I guess that is why I have always been eager to help and encourage people to strive, plan ahead and succeed! Well 10 years ago, I started my German Shepherd business and I always had a dream to do something different, even though I did not know exactly what that would be. I just knew one thing for sure; I loved animals, especially German Shepherd dogs! As my business grew, it was difficult to keep up with the increase in sales, dogs, kennels and care for my German Shepherds while Dan and I had full time jobs. I knew I did not want to have more dogs than I could love every day, so this is the first time I am sharing a story that began in 2009. God has truly blessed me between my customers, my German Shepherds and the exceptional young people that have helped my business in such a positive way. Please take the time to read my story. 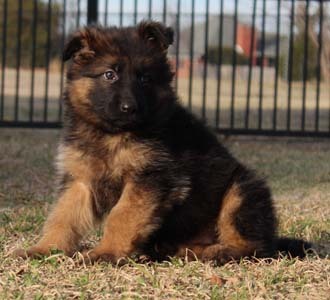 The pictures are of the female we just sold out of Xena and Karson's litter. There was only 1 female born along with 8 males. The female puppy was purchased by the sweetest teenager, Kimmy. She loves her so much already and she could not have gone to a better home. Of course, Kimmy will have to wait a few more weeks to get her when she is 8 weeks. She comes to visit every chance she gets to bond with her between school and activities. My heart really goes out to good kids and especially good teenagers. I have a soft spot for them. Now, let's start at the beginning. The first high school student that came to me about working out a program to help pay for her college with a dream of being a Doctor. Her name is Elisabeth and she started college classes while she was still in high school. She worked several jobs to save up money for her first puppy. She had always wanted a German Shepherd dog. Her dad worked at the Sheriff's Office and I had known him since 1995, the year I started and the same year I met my husband, Dan. Elisabeth and I agreed on a business plan. In 2009, She bought a female from us named Arabella (Daughter of Mason and Bailey. I told her the female had to be at least 2 years old and then I would breed her to one of our males. I would then give her half the money from the sale of the puppies to go towards a college education fund. 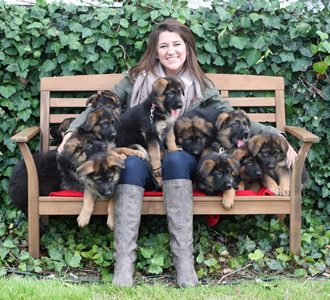 One of the jobs she did on the side was photography, which helped out tremendously with the puppies. I was building the Von der Otto website and Elisabeth was providing the beautiful photographs of the puppies. She helped socialize them and helped on Saturdays with customers during viewing times. On occasion, when one puppy might have needed individual care, she would take it home to care for it, along with the help of her family. Elisabeth was raised with parents that had previously bred other types of smaller dogs. This experience was beneficial to all of us. Five years later, we continue to partner with Elisabeth and her family on breeding her female dog. I am happy to report that she has completed her undergraduate program at the age of 20 and is currently working on her Doctrine. It is rewarding for Dan and I to know that Von der Otto Kennels had an impact on assisting with a portion of Elisabeth's successful journey of her educational dream. In 2011, along came Sydney. She and her siblings were introduced to Dan and I by her mother whom briefly worked for us at the Sheriff's office. These three kids were in need of community service hours required by certain classes and organizations at the local Rockwall schools. Dan and I agreed to let them come over and socialize the puppies and help with a few chores. Immediately, Sydney fell in love with the puppies and began to beg her parents for one of her own. Well, her parents thought a polite way of telling Sydney NO was....telling her that she had to pay for the puppy herself! Her parents thought that would be the end of that discussion!!! Although, Sydney did not give up with that answer, she would find a way! She knew of Elisabeth and our business deal with partnering on the puppies. Sydney had previously helped care for some of those puppies. So, Sydney came to me with a proposal to work at the kennels towards a female dog of her own and when the female was ready to breed, we would partner on the sale of the puppies. The income from the sale of the puppies would go into Sydney's college education fund. She successfully convinced Dan and I, along with her parents, towards her business endeavor. Two and a half years later, after much motivation, hard work and dedication, Sydney's dog Xena (Daughter of Cora and Hagen) was bred with our male Karson (Son of Mason and Daffi). The litter of 9 was born, January 2014. I am so proud of Sydney. Through the past few years she assisted us with everything from cleaning kennels and dogs, vet visits, puppy deliveries, leash training, AKC registration, showing our shepherds in dog shows and even helping Dan build fences! Sydney is faithfully at our kennels almost EVERY Saturday. Many of our customers and colleagues have met her during their visits to our home/kennels and training days in Sherman, TX or when she attends the dog shows with Dan and I. She has proven to be an outstanding young lady. I know one day, Sydney will become the engineer that she dreams of being!!!!!! Always Catch Those Dreams, Sydney! YOU DESERVE IT!!!! 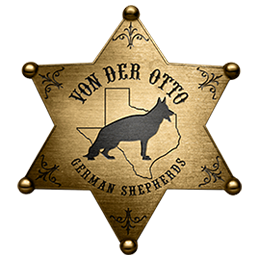 Von der Otto kennels will continue to partner with inspiring teenagers to enhance their educational funds. Dan and I enjoy teaching and mentoring these young people in the hopes that we can make a difference in their lives. They get the opportunity to experience the cycles of life from birth onward, the medical insights from the female cycles, ovulation, breeding, pregnancy and delivery. 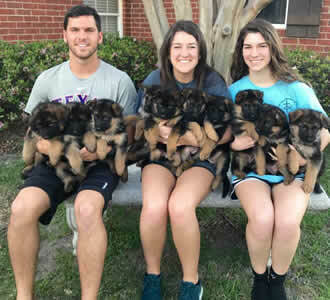 When their female has puppies, they get the first-hand experience of the growth and development of these puppies from birth to the first 8 weeks of life. Lastly, the student learns the importance of health with feedings, puppy vaccinations, socializing and exercise. We have already selected our next teenage student, Avery to begin the summer of 2015. She has already been visiting our kennels and interacting with our German Shepherds. We can only choose one student at a time due to the size of our business. We pride ourselves on being a small size business to give individual love and attention to each dog. 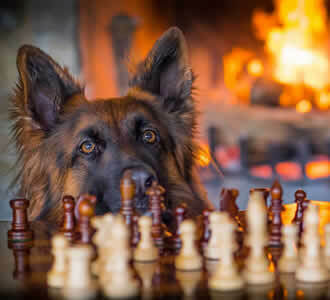 It is important to us to select a student that will be with us for several years so they are well trained with our German Shepherds and they can gather years of experience. We carefully select these students that have parents willing to assist and supervise at times, due to the extreme responsibility of the care of our dogs. These German Shepherds are part of our family and these teenagers also become our extended family. They are all very important to us. Another reason we choose high school teenagers opposed to college/technical students is because we want the constant assistance weekly, which could not be possible as older students may need stable income. Pictures are on my Facebook page or you can see pictures on Xena and Karson's Puppy Pictures. Any questions call me at 214-232-3194.